OK, so I realize not everyone shares my obsession with the NFL. However, it's my turn to host the Carnival, so I get to evoke executive privilege and use whatever darn theme I want. So with apologies to those who don't share this passion, I present to you the September 2012 Leadership Development Carnival, NFL Kick-off Edition. I've done my best to be nuetral and refrain from trash talking. No playoffs for 13 years! Maybe this year will be different..... This post seems to be a good fit for my favorite team, the Bills: How to be a Leader in a Crappy Culture. Lynn Dessert from Elephants at Work completes a hail mary pass with Using the Benchmarks® Assessment for Leadership Development. "As with many assessments, Benchmarks® delivers insights to many leaders about their actions and behaviors through feedback from a broad range of groups they interact with inside their organization." Anne Perschel scores with Dear Leader: What's Your 400 Year Business Plan?, from her Germane Insights blog. Dr. Anne Perschel takes us on a tour of French Forests and the Cognac industry, to learn why leaders need to create a 400 year business plan and how to get started. Jim Taggart, another Pats fan from Ottawa, gets a sack with How to Unlock the Hidden Knowledge in Your Organization, from his website-blog Changing Winds. "The five suggestions I put forward in this post have leadership as the core, though I don’t dwell on leadership per se. But I think the subject is very important, given the state of the North American economy." The Patriots seem to be the leadership blogger's team of choice. Scott Eblin, from Next Level Blog, converts a two-point conversion with How to Connect Your Team with the Mission. "An F-15 squadron commander shares how he connected his entire team with the mission by literally showing each of them how they matter." Carrie Koens, from Weaving Influence, completes a pass to Julie Winkle Giulioni, who wrote Talent Management Systems: Sometimes the Cure Makes the Patient Sicker. "Well-intentioned talent management systems are frequently to blame for undermining the quality of career conversations. Development doesn't occur on schedule, it happens a little bit every day, on the employee's schedule, through intentional interactions and conversations." Sharlyn Lauby, from HR Bartender, gets a big hit with Your Company’s Next Innovation Will Be the Result of Empathy . "I’ve seen a couple of blog posts recently about the need to restore empathy. While technology is fabulous, it doesn’t replace dealing with people." Lolly Daskal, from Lead From Within, gets a two point conversion with Leadership: Challenging The Status Quo. "Every single leader, movement, and organization that has ever wanted to create greatness has had to challenge the status quo." Tanveer Naseer from TanveerNaseer.com returns a punt for a score with 3 Keys To Successfully Leading Today's Evolving Workplaces. Welcome to the Carnival Karin Hurt, from Let's Grow Leaders. Karin breaks a tackle for a long one with Following the Leader? Stop Notice How it Makes You Feel. "There is much we can learn from following. We all find ourselves in positions to follow both great and horrible leaders from time to time. It helps to stop and really pay attention to how we feel during the process." Linda Fisher Thornton, author of the Leading in Context Blog, shares Civility and Openness to Learning, which explores the connection between our willingness to learn from others and how we treat people when we disagree. Robert Tanner, next month's Carnival host, from Management is a Journey sacks the QB for a loss with The Words that Change America. Jesse Lyn Stoner, from Jesse Lyn Stoner Blog, (who also likes the Patriots), completes a nice pass with Manage the Challenges of Working in a Matrix . "Do you need to coordinate your work with people who report to a different boss? Matrix organizations are becoming more common as organizations grow larger, become more complex, and/or enter global markets. They offer many advantages, but these can be quickly overshadowed by the challenges. Here are 4 challenges and how to manage them." S. Chris Edmonds, from Driving Results Through Culture, runs for a first down with A Safe, Inspiring Culture, or Not So Much? "Blanchard's culture guru S. Chris Edmonds examines the worst company to work for in America and outlines how to measure employee opinions." Diane Laux submits a post from Maril MacDonald's Blog Let Go and Lead called What You Focus on Manifests Itself. Mary Ila Ward, from Horizon Point Consulting, catches one over the middle with Recruiting Strategy- Grow Your Own. "Grow Your Own" helps companies think about what their responsibility is in closing the skills gap through developing talent within. Randy Conley, from Leading with Trust, runs for a TD with Five Leadership Lessons From The Life of Neil Armstrong. Anna Farmery, from The Engaging Brand, scores with 5 Common Mistakes with Social Media. "Leaders are still reluctant to embrace social media and yet the world has changed, here are some tips for anyone who - or who has a boss - who is reticent about embracing social media." Eric Pennington, from Epic Living, scores a two-point conversion with Why We Need Critical Thinking. In this post, Eric Pennington, looks at the lost art of critical thinking and why need it now more than ever. Wally Bock from Three Star Leadership throws for 400 yards with The Lubrication of Little Words. "It doesn't take a lot to make things go more smoothly on your team. A few little words, repeated often, will do the trick." Melody Bridgewater submits a trick-play post from Robyn McLeod, from The Thoughtful Leaders Blog called Your face may be stopping you from moving ahead . "Robyn McLeod of Chatsworth Consulting Group talks about ways leaders can build a stronger presence and effective relationships by being more aware of their facial expressions, gestures, and tone." Chase Dumont, from Chase Dumont, Rainmaker, gets a first down with The 9 Essential Qualities of Leadership. "In 1917, Major C.A. Bach gave a farewell address on leadership to Fort Sheridan's graduating officers. 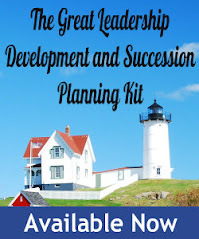 The address ended up being one of the most outstanding addresses ever given on the subject of leadership - and this post dives deep into understanding Bach's 9 essential leadership qualities outlined therein." Steve Roesler from All Things Workplace runs for 100 yards with Success, Failure, and Fear. "We're all familiar with fear of failure, but have you ever thought about 'fear of success?' "
Bernd Geropp makes a bit hit with What makes a great business vision statement?, from his More Leadership, Less Management blog. "Many entrepreneurs and senior managers tend to work around the clock, but take too little time for the real leadership tasks." Angie Butcher submits a big play post from Deb Mills-Scofield from Innovanomics called I Don't Have it All - Yeah!". "This blog post discusses the "I-Thou" leadership style. This is the idea of putting those under you first and using other's success to measure your own. Throughout my career, when I focus on the “Thou”, helping my clients’ solve challenges and innovate resulting in growth, jobs, philanthropy, the “I” takes care of itself. When I focus on the needs of others, clients, entrepreneurs and students I mentor - my network, my own business grows as well." John Hunter, from Curious Cat Management Improvement Blog, returns a punt for a touchdown with Creating a Quality Culture. "To build a culture that supports customer focused continuous improvement a management system needs to reinforce consistent behavior that re-enforces this culture over the long term." Mark Bennett from TalentedApps catches a pass in stride with Let the Kudos In. "We get told a lot to show appreciation, but do we truly make the most of the thanks we receive? Leaders can bring long lasting benefit by helping their teams know how to really let kudos in." Chery Gegelman nailed a 50 yard field goal with her post on SmartBlog on Leadership called A Leadership Revolution, And Why It Matters To You. "Many CEOs have identified creativity and innovation as critically important to growing their organizations. My experiences have convinced me that most of what they are seeking is lying dormant in in the knowledge and experiences of their employees and customers, and that employees are longing for the opportunity to be included, involved and unleashed." Chery Lived in LA when the Saints won the Super Bowl, and adds "Absolutely LOVE IT when people who are weary and worn, have something to unite around and celebrate!" Joel Garfinkle, from Career Advancement Blog, breaks a tackle with How to Get Your Shy Employees to Speak Up in Meetings . Mark Stelzner, from Inflexion Point gets an interception with Why Service Provider Relationships Fail (And What You Can Do About It). Mary Jo Asmus, from Mary Jo Asmus, performs an graceful leap with Easing the Pain. "A little bit of caring goes a long way for a leader and organizational results. Here are some things leaders can do to make work a better place to be." Mary Jo actually prefers ballet to football. "Did you know that football season coincides with ballet season? Ah…the grace and beauty of a well performed classical ballet! My favorite professional ballet company is the San Francisco Ballet." they are outgoing, assertive, give speeches and presentations and is someone who has self-confidence. No one thinks of an introvert fitting in as a leader- until recently. Introverts are beginning to get out of their comfort zone and take advantage of the unique characteristics they possess." David Burkus, from LDRLB, scores with Why Celebrity Leaders May Actually Be Falling Stars. "NFL? No. College? Yes. Boomer Sooner (OU)". That's it for this month's edition! Hope your team (real or fantasy) wins this weekend. Many thanks Dan, for this month's carnival and for including my post! I have really been enjoying all the great post. So fun to be a part of this.